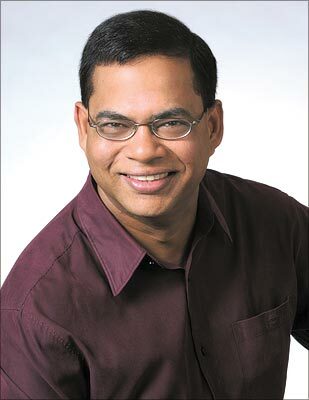 For his major contribution, Singhal has effectively rewritten Sergey Brin’s magic formula, and changing the way the world accesses information forever. However, Singhal is still frustrated with search. Despite having just announced a raft of impressive search innovations, which include being able to ask Google questions out loud and drop in any old holiday snap into the engine in order to find out forgotten details about a trip from long ago, Singhal wants more from “his relationship with his search engine”. That will sound ominous to plenty of people. Could an Orwellian, Big Brother-style menace be on the horizon, ushered in by this casually-dressed, laid-back scientist and his colleagues? Singhal instantly offers assurances that Google, and all search engines, would need to be very respectful of users’ privacy when building and implementing such technologies. However frightening the vision of a search engine which knows what a person wants to know before they even do may seem, Singhal makes a convincing case for the transformative experience it will offer users. And as ever with these disruptive innovative technology companies, seems to be offering people a solution to a problem they don’t yet know that they have. “I still waste a lot of time when I am searching. The conversation still feels broken… Search is not as efficient as I want it to be. “For instance, today I have a ‘to-do’ list on my phone which contains tasks like – ‘pick up a gift for my father’. The phone has a GPS system and knows where I am. It also contains my calendar, so it knows when I am free. Singhal describes this type of pre-emptive relationship with a search engine as the “holy grail” but says that Google and the technologies available are not that far off this type of interaction. However, he warns that his Google team of engineers who are making the glue needed to stick all the elements of people’s lives together in this coherent fashion, will need to be “intelligent”, otherwise it will be interruptive which is not acceptable. “We need to make sure that the way we create this type of intuitive search is intelligent – otherwise it will just annoy people and not have the desired effect – which is to make lives easier and speed up the search for relevant information. “Putting the finish on this type of product, which links all aspects of our lives together – is no easy feat,” he explains. He also knows that search, which is still the core of the company and responsible for the majority of Google’s revenues, and all other products the technology giant brings out, need to represent good enough value for people not to mind paying with their data. Singhal admits that search has gone further than he ever thought it would in his life time. He says is getting more and more confident every day that his vision of a search engine people regularly communicate with on a two-way basis will also be realised during his career at Google, which he hopes will never end.